Only one of my kids is almost completely responsible for wrecking all the pants we have. He can do it so quickly the rest of the pants looks almost unworn. And no matter how much I like shopping, I do not like to throw things away. So, knee-repairing it is! These pants were all bruised by the same knees. I will first show you the quickest way to fix a hole, by just using a ready made patch from the store. Than more tedious ones, by cutting them yourself. Than I will show you how I put a piece of cloth behind the opening, so you can show the unfinished broken parts of the fabric. Seems to be a trend nowadays. Last of all I have opened up an entire pants front panel, and added a few new (very thick) parts of fabric. This will certainly cost you more time but you will see this pants got a completely new look. With the first pants it is very much possible the pads look familiar to you? These kind of knee-pads you can still find anywhere. These particular ones have been used over and over again. 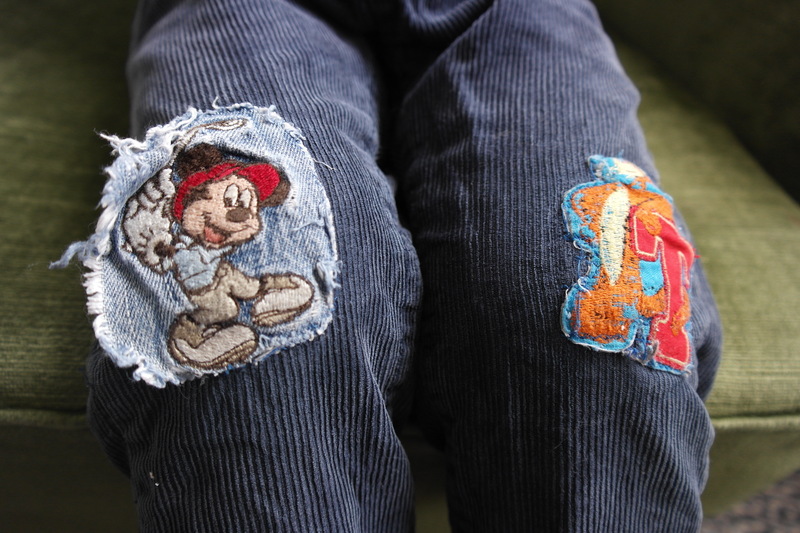 After the pants disintegrated they were reused on a different pair. 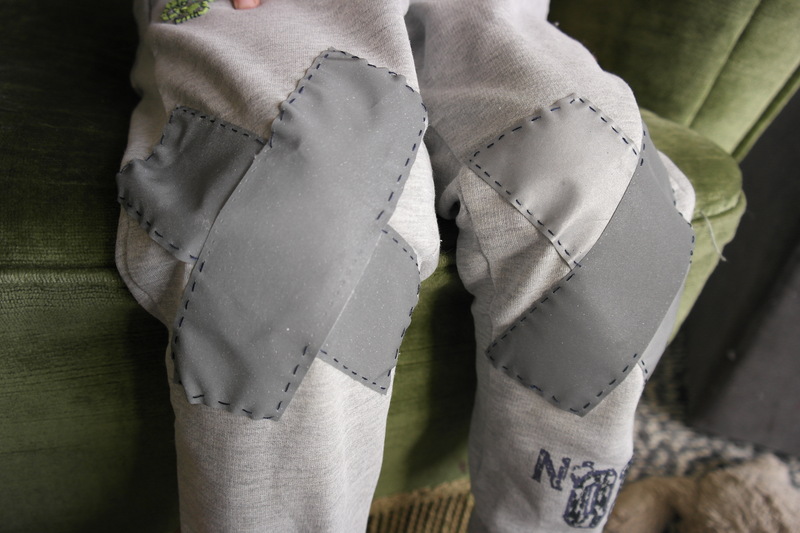 I liked the old fashioned cord combinded with the old and original version of these knee-pads. With the next blue sweat pants I have selected pads very close to the original colour. These can be found anywhere, and are the easiest to use. They can just be ironed on! I wanted to add stitching for a bit more of a playfull feel, but for the fastening it is not necessary. I matched this stitching thread with the numbers to have a new look for the pants. 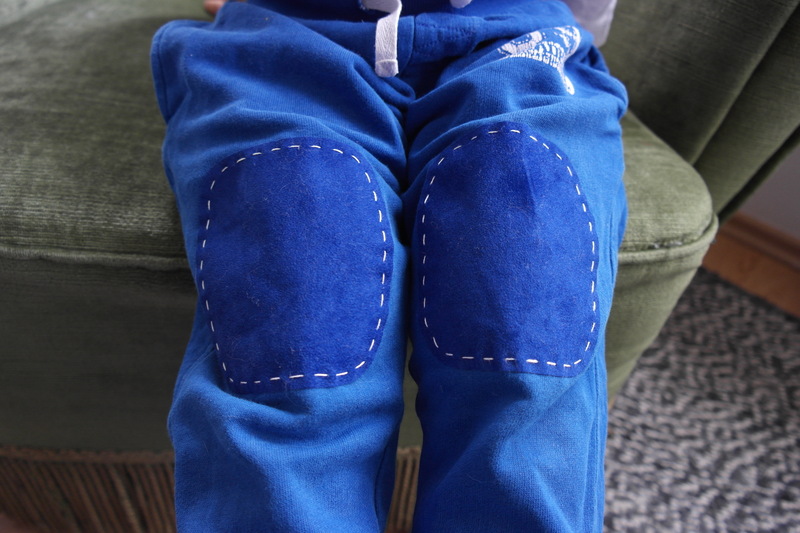 These knee-pads have readymade hole so the stiching was easily done by hand and quick to boot. If you like a bit more novelty than oval shaped knee-pads, try cutting a nice fabric in the shape of, for example, triangles. If you like you could always add two sided fusing between the two layers of fabric, they might hold better but I have not seen any proof that mine let go too quickly. Anyway, get creative! I have made sure that the finish of this pad is, well, unfinished. I took a thick tread and went round the shape. The first washing left its lovely mark. Truly upcycled are these crosses. They come from a different garment I took apart after it got damaged. It is even safer for the kids during nightfall! These crosses mean, these pants are tired of damage! These pants are the repair work of a friend. It works so well because the knees of this pants have many different layers. 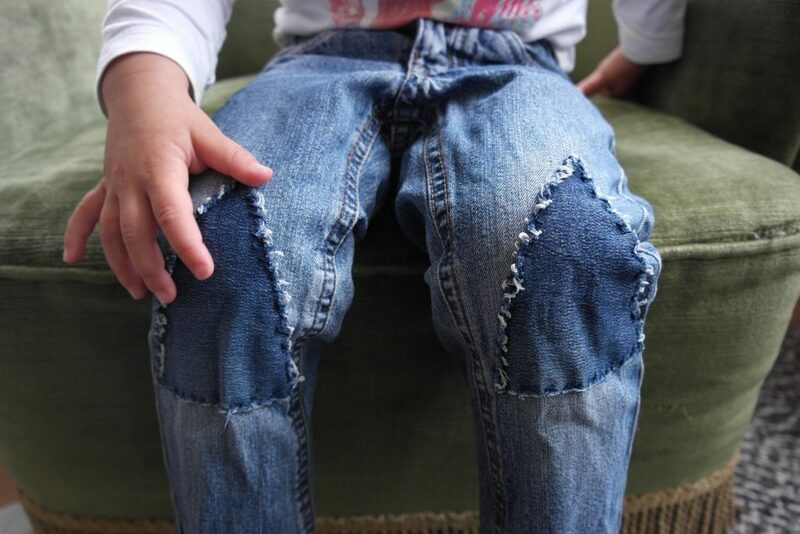 You could always add a layer of fabric on the back of a pair of pants and start stitching. Just keep stitching, just keep stitching! The next few knees have been repaired by adding a layer on the back. The smaller the size of the pants the more difficult this is as you cannot run down the inside of the pants with your machine easily. You could play with this, and add a knee-pad with a different colour or even a pattern. 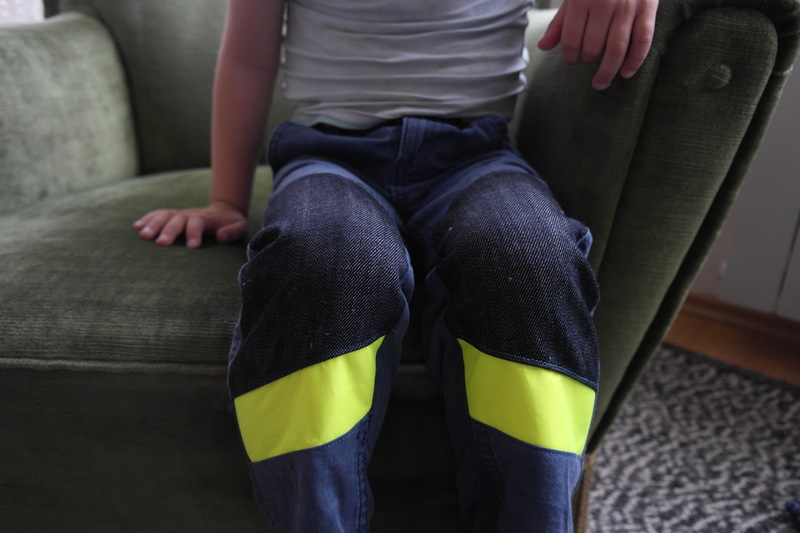 If you fastened the pads only on the top and the side you leave a bit of room that will make sure when the kids sits or runs the hole will change and the position of the leg will show more or less of the layer of fabric on the inside of the pants. Make sure you make this layer long enough inside the pants! The inside has a layer, fastend only above and the sides of the hole, so it will widen when walking. Now, the last leg. It took some time to open up the entire front panel of this garment as it was stiched trought with a thick yarn multiple times. I cut the front panel off and replaced the part that was broken with a new thick layer of fabric. You can really get creative with this one. He called this his work-pants! 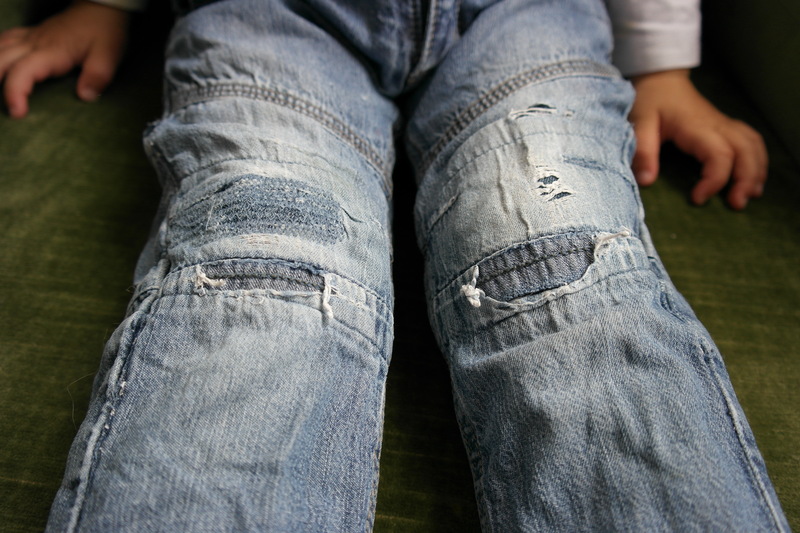 I am sure you can also see there is much much more that can be done to make pants look like new. Or atleast have them wear broken pants a bit longer, untill they grow out of them. Or what about fixing pants in such a way it turns into girly pants where it were boys pants? Just dont toss them away right away. This way you can make sure your kids are wearing unique items! The next pants has fake leather knees taken from an old legging somebody thoughtful gave me. I have added red hand sewn tags throughout the garment. Just because I liked giving it a little bit of an update! Posted on May 30, 2017 by Marjolein. 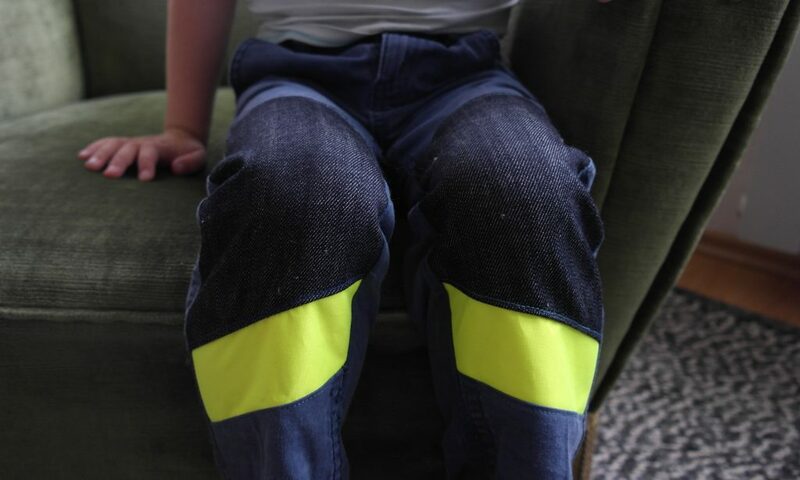 This entry was posted in upcycle and tagged creative, handwork, kneepads, recycle, repairwork, upcycle. Bookmark the permalink. Leuk en erg practisch!!!! Dan “leeft” een broek wel twee ,drie keer langer. Want kinderen spelen en van spelen komen er gaten in broeken.